We’d love this to be a page where we list both Raglan Area School Clubs as well as the many fantastic clubs and sports activities that are available in our community. If your child wants to be involved in any of our internal clubs then please contact Karen at reception and she will refer you on to the appropriate contact. If you would like to add your Sports, Music or other club, please Contact Us with the details. Every Thursday lunch time, Mr C opens the senior school science laboratory for our junior school students to be dazzled by scientific investigations and hands on experiments. This is a ‘must join’ club, full of fun learning for our Junior School by our amazing action packed Science teacher – Mr C! Every Tuesday lunchtime, Whaea Arna Rose opens the Computer lab to our Junior school for an eLearning experience. Google classroom, Google Docs, gonoodle, ePortfolio, Google Apps are all on the go here. Another fun learning club the primary school offers our students. Every Wednesday lunchtime, Whaea Gabrielle grabs her surfboard along with a crew of supportive parents and takes a keen group of Year 4-6 surfers to Ngarunui Beach for an afternoon session of surfing. 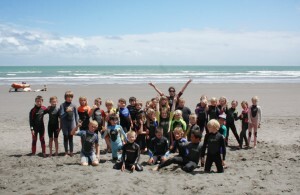 Wow, Raglan Area School students learning in the classroom and out on the waves! Every Friday lunchtime Whaea Sarah Jayne along with our brilliant community house workers get down and dirty for our environment. Planting vegetables, building box gardens, collecting composts, harvesting kai all loving what they are doing as Kaitiaki for our Junior school area! Ever heard the saying – only a surfer knows the feeling? 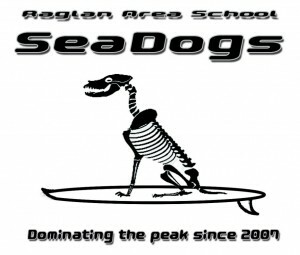 Well if you want to find out what it means or you already know and like the feeling… the Raglan area School surf club, known as the SeaDogs might be your chance to score some epic waves. The group is open to all students and meets every Wednesday after school. We travel to the beach or Manu Bay (depending on the conditions) by school mini bus and return to school around 4.30pm. Once per year we embark on the legendary SeaDogs Surf Camp to wherever the waves are pumping. The club has some equipment available for students to use. If you have your own gear Surfboards and wetsuits can be stored at school on the day. Please see Mr C or Matua Pete for an application letter. Parents and caregivers welcome. Raglan Area School is fortunate to be a member of a cluster of schools residing in the Western wing of the Waikato province. These Kura include Te Uku, Te Mata, Te Kōwhai, Horotiu, Waitetuna, Whatawhata, Rotokauri and Raglan Area. Each school term these Western Cluster Kura come together to provide sporting, academic and creative opportunities for students to showcase their talents. These opportunities provide for students of all ages that is new entrant through to years 8 and include codes such as Swimming, Cross country, Football and Kapa Haka. This year (2016) the Western Cluster committee introduced a new item called Māori Games which shall replace the traditional Hard Court day. This is an exciting opportunity and it demonstrates the awesome fortuitous nature of Kura collaborating together. Parents are invited to peruse the gallery of images and calendar of events. Raglan Area School warmly welcomes parents to join us at any of these events. 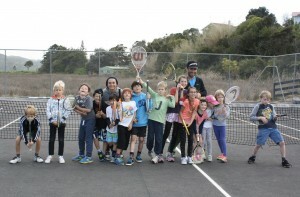 Guillaume and Laura from the NZ Tennis Academy run group tennis sessions for kids in Raglan on Friday afternoons. Kids will learn all the basic techniques, hand-eye coordination, scoring and rules and have lots of fun at the same time. The usual cost for the 7 week programme is $60 per child. Tennis racquets are supplied for those who don’t have them. For more info go to: NZ Tennis Academy website.